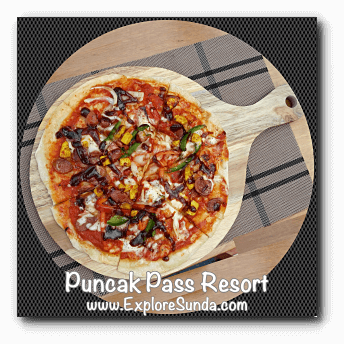 Puncak Pass Resort is the pioneer of hotel and restaurant in Puncak. It opened its doors for business since 1928! 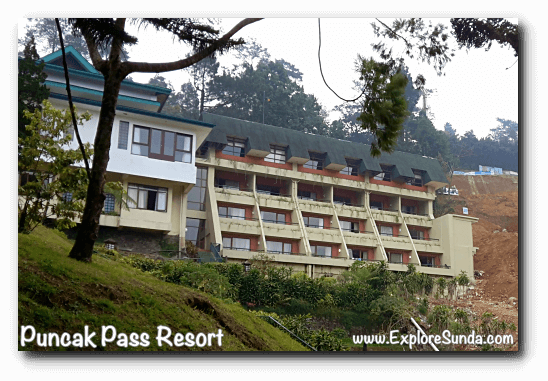 Today, we still can see, feel and taste the glimpse of the old days in this resort. Do you want to know how? 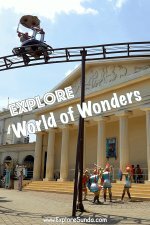 The first thing you will notice upon arriving in this resort is the land, It is huge, with lavish garden. 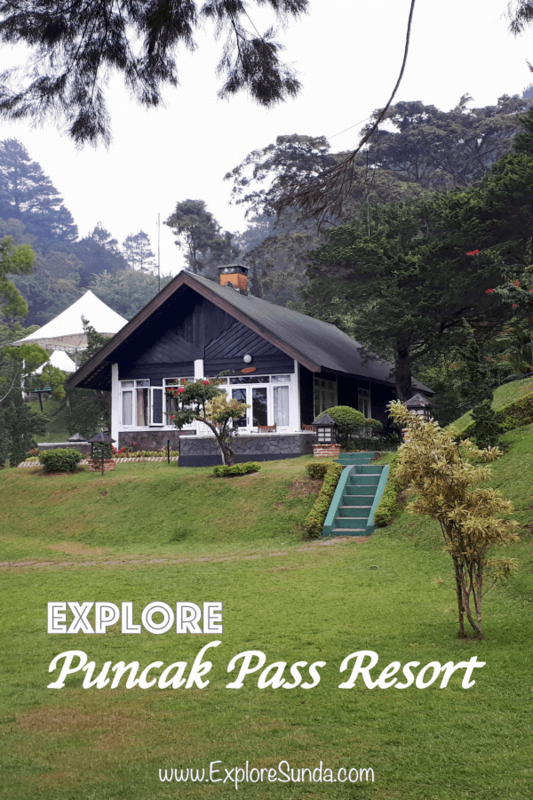 Unlike other newer hotels and resorts in Puncak, this resort has more than 5 ha of land, but the hotel was built on less than 10% of its land, so you will be surrounded with greenery, from grass, flower bushes to tall pine trees. 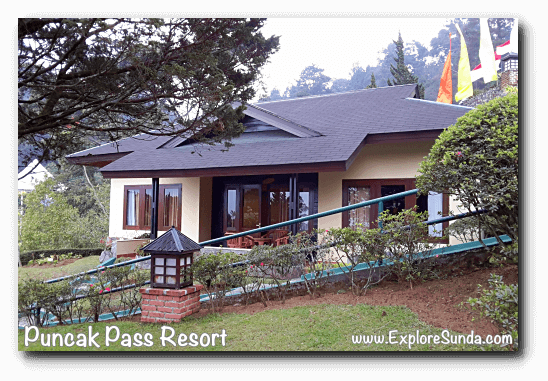 The location of this resort is on jalan Raya Puncak, the GPS coordinates are 6°42'24.0"S 106°59'36.0"E (-6.706667, 106.993332). 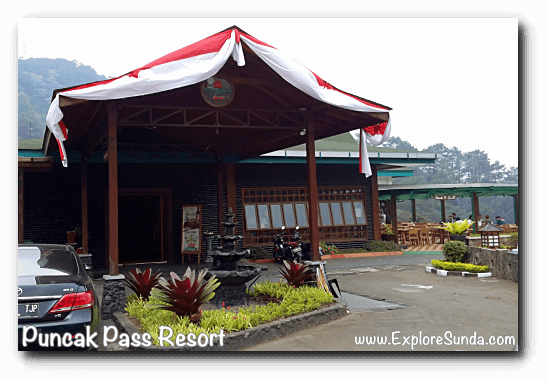 At approximately 1,400 meters above mean sea level, the resort is on the highest point allowable to build any permanent structure in Puncak. So, it is given that you will experience cold breezes all day long and mist surrounds the area everyday, starting late afternoon until the next morning. 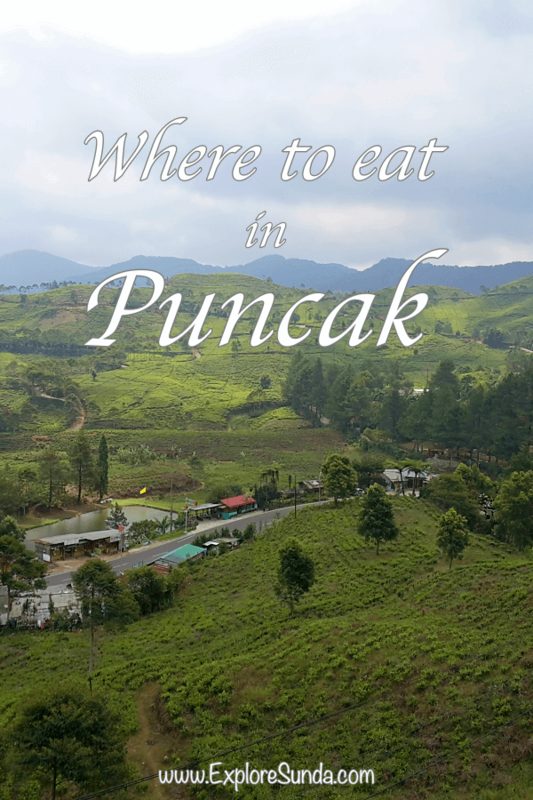 Over the years, more and more people visit Puncak for weekend getaways, holidays, and company outings, resulting in tremendous development of hotels, resorts, villas and restaurants along the way of Puncak main road, from Ciawi to Cipanas. We can see few of the old ones along the road, but most of them are hidden in the narrow alleys, which are difficult to find, especially at nights. I'm not even sure how the vehicles are able to maneuver once they turn into those alleys. 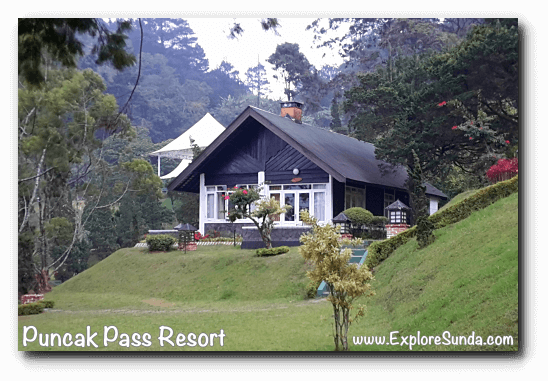 Hence, it's another plus point that Puncak Pass Resort is located on the main road. The downside of the uncontrollable developments is that it often ruin the ecosystem, resulted in several landslides. 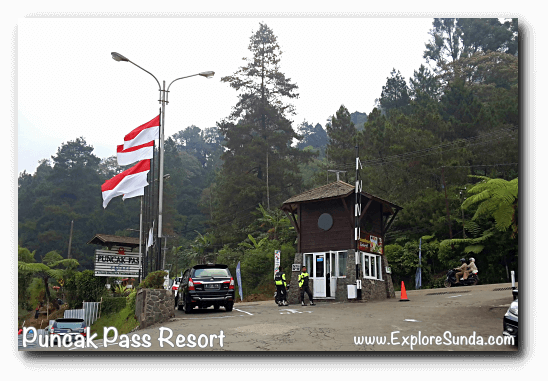 Earlier this year, there were two landslides near Puncak Pass Resort. The last one destroyed some of its buildings. Several months later the ruin has gone, but the slope and land is still under construction. Back to the good old glory of the resort, as I mentioned it was opened in 1928, during Dutch settlement. The good news is this resort keep the ambience, the furnitures and the building the same as it was. 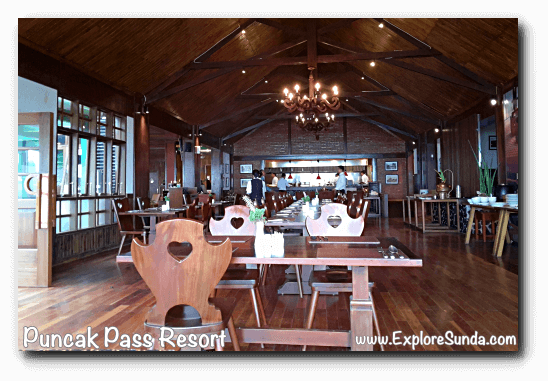 So, you will see dark teak wood used on the door and window frames, the same color of teak wood used in the restaurant, from the ceiling to wooden floors, as well as dining tables and chairs. 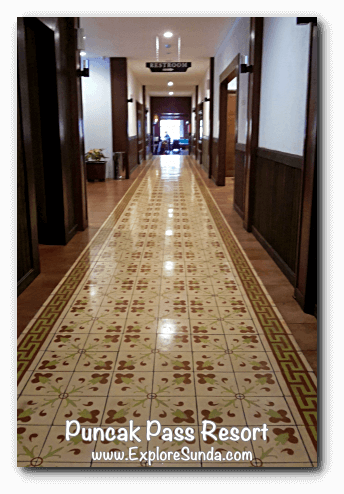 They even maintained the old fashioned tiles, the 20cm square of small colorful patterned tiles. You will see the beautiful patterns in the corridor. People love to dine in the restaurant, since it is one of the few restaurants which served old times cuisines. Its Poffertjes, Pannekoek (pancakes), Bitterballen, and Beef Croquette are the most sought after dishes here along with the Beef Steak Tempo Doeloe. It because they never change the recipe since the beginning. They also serve selections of burgers, pastas, pizzas and steaks. 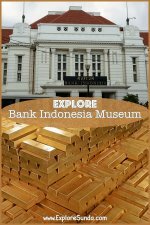 If you prefer Indonesian dishes, I heard the popular choices are ox tail soup and fried rice. It is not a common practice to include liquor selections in the menu, but this restaurant lists them alongside with juices, milk shake and cold/hot beverages, as well as traditional hot drinks such as bajigur and bandrek. 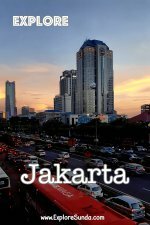 Even the tea, which is the most common drink served in any restaurant in Indonesia, is not common at all: it is the most bitter tea I ever drink! 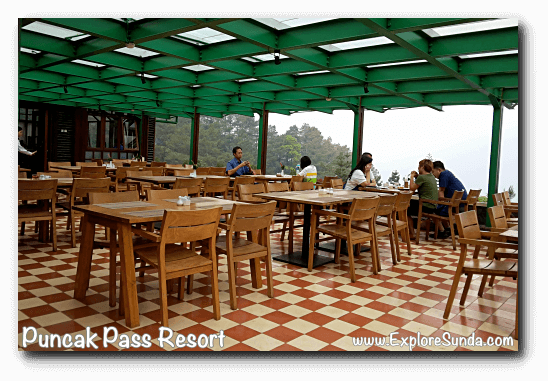 The restaurant has two dining options: inside the restaurant or on the terrace. Either way I prefer to sit close to the windows or the edge of the terrace, where I can enjoy the panoramic view below. There are several types of rooms available here. There are three stories hotel rooms and several cottages/bungalows. 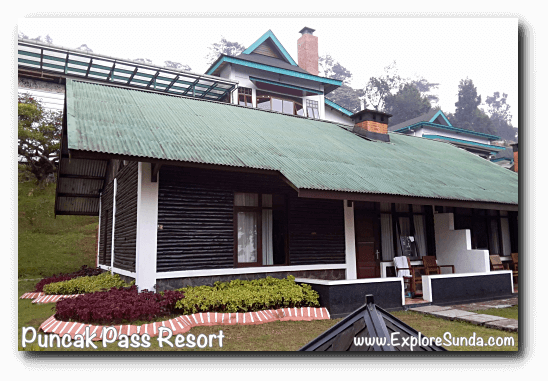 If you have higher budget, try the bungalow. They look like a charming small house, complete with a living room. The exteriors either look like a wooden cottage or a tropical house. There are not so many rooms available in this hotel, so it will be quiet at nights, unless there's a party. The resort also has a big swimming pool, unfortunately it is still under renovation, without any due date when it will be finished. I guess now it will take much longer due to the land slide problem. 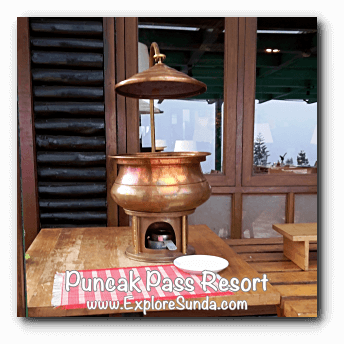 Anyway, when it was fully functioned, few guests swam there since the water is freezing! 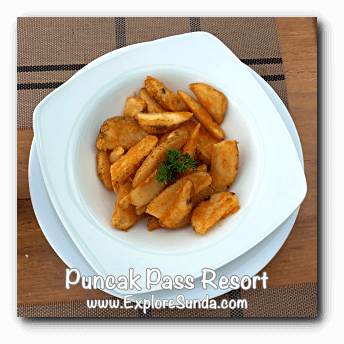 Being the most favorite family vacation destinations in the land of Sunda, there are plenty of restaurants with different types of food served we can choose in Puncak. More favorite restaurants are listed here.